Lake Ontario visitors may enjoy watching waterfowl on the lake’s surface, hawks circling overhead and trees on the bank, but they may not notice the entire ecosystem under the water. 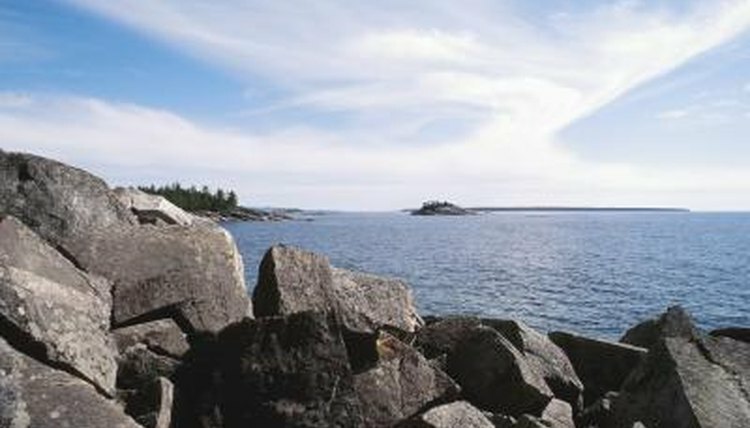 Although it’s the smallest of the Great Lakes in surface area, Ontario holds almost four times as much water as the similarly sized Lake Erie, making the environment ideal for a wide variety of fish. Unfortunately, several of these species are considered threatened or endangered. The diminutive longear sunfish is listed as a threatened species and may be on its way to becoming endangered. It is visually striking, with a bright orange belly and blue-green stripes along its head. It mostly lives in the weed beds of small rivers, but occasionally is found along Lake Ontario drainage basins. Potential reasons for its threatened status may include the pollution of the lake water with silt and clay, general water quality deterioration and hybridization with the closely related pumpkinseed or green sunfish. This ancient fish is another species that is not yet listed as endangered, but is threatened and at risk of becoming endangered. The sturgeon is impressively large, sometimes growing up to 7 feet long and can weigh more than 300 pounds. It’s also one of the longest-living fish and does not reach maturity until between the ages of 8 and 19 (in the case of the males) and 14 and 23 (in the case of the females). Since 1995, Lake Ontario occasionally has been supplemented with hatchery-raised sturgeon, but the species’ population still is dwindling. Risk factors may include overfishing, harvesting sturgeon eggs for caviar and dams that cut off nurseries and spawning areas. The tiny pugnose shiner (which averages about 2 inches in length) is one of the rarest minnows in North America, found only in the bays of Lake Ontario and the Saint Lawrence River. It has a tan back, white belly, silver sides and a distinctively small and upturned mouth. This endangered species is threatened in part due to increased turbidity (the muddiness created by stirred-up sediment). As the name implies, this species fares best in deep, cool waters (making Lake Ontario an ideal environment). Its long, tapered body can grow to be up to 9 inches, and it can be identified by its blunt snout, flat head and eyes that are close set on top of its head. They used to be found commonly in Lake Ontario, but now is an endangered species. Scientists suggest that this may be because of the invasive round goby and other fish such as smelt, which compete with the sculpin for food and eats its eggs. Juliana Weiss-Roessler has been writing since 2000. She worked as the head of the Web content department for the star of an Emmy-nominated reality series. Her ghostwriting has appeared in "PARADE" and "People." Weiss-Roessler is a blogger for Resumark and an editor for Pink Raygun. She has a Bachelor of Arts in English from the University of Florida. Are There Any Endangered Species in the Bermuda Triangle? What Animals Live in the Volga River?